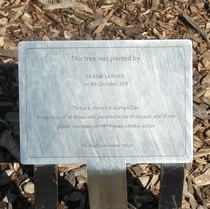 This tree was planted by Frank Lerner on 8th October 2011 to mark Victory in Europe Day in memory of all those who perished in the Holocaust and of the Jewish members of HM forces killed in action. Buddy Bear is on the right of the photograph and the plaques beneath the trees are from centre left to right: Victory in Europe Day 1, Victory in Europe Day 2 and The Burma Campaign. Margaret Damer Dawson lived here.